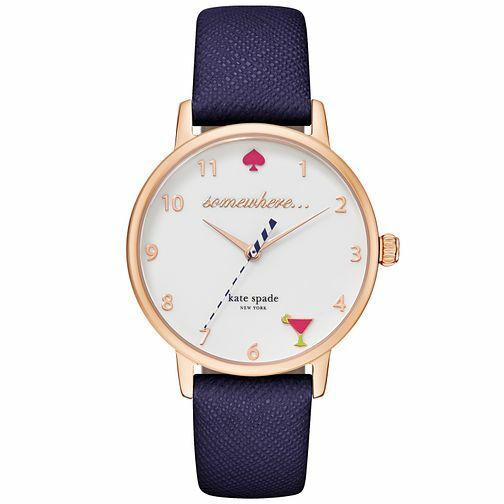 This blue leather strap watch from Kate Spade's Metro collection features a rose gold case, round white dial with cocktail glass motif, bold second hand and pink Kate Spade branding. A perfect finish to any look. Kate Spade Metro Ladies' Rose Gold Tone Strap Watch is rated 5.0 out of 5 by 1. Rated 5 out of 5 by Anonymous from Beautiful watch The watch is just as I hope and very comfortable to wear. The leather strap took a couple of says to soften but is now perfect. I was a bit nervous setting the time as the crown was a little stiff but it was fine. It's always 5 o'clock somewhere so that marks cocktail time at the weekend!! Purchased using the link through Quidco so I hope my cashback will be processed soon as so far Ernest Jones have been excellent.